You helped us conserve Bennett Island! 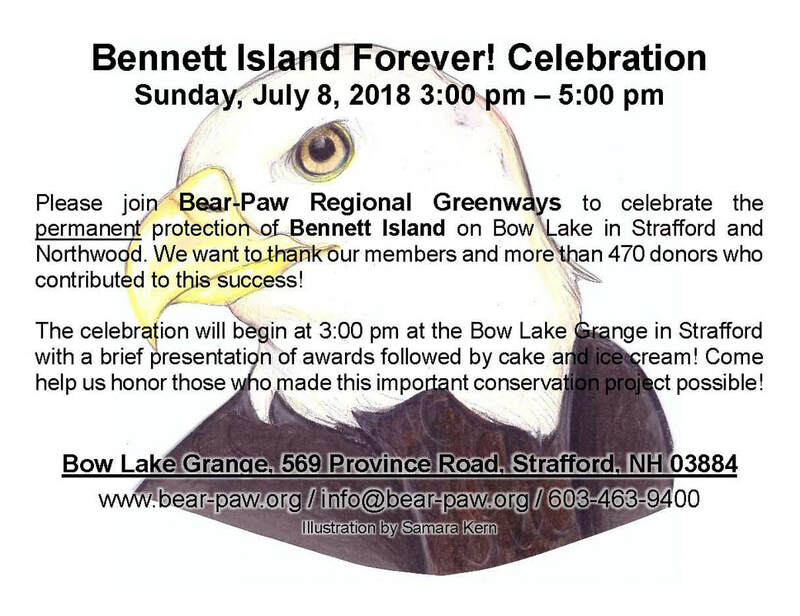 Please join us to celebrate the permanent protection of Bennett Island on Bow Lake in Strafford and Northwood. The celebration will begin at 3:00 pm on July 8th at the Bow Lake Grange in Strafford with a brief presentation of awards followed by cake and ice cream! Come help us honor those who made this important conservation project possible! We want to thank 471 families who contributed to the campaign to Save Bennett Island Forever! Your overwhelming response and generosity was inspiring. You flocked flamingos, attended house parties, sent in contributions in response to newsletter articles and other appeals, and some even swam one mile around Bennett Island (and asked your friends and families to support your personal effort to protect the island). Bear-Paw has never seen such widespread community support for one of its conservation projects. Bear-Paw has completed the conservation easement to permanently protect the island. The members of Bear-Paw and the other contributors to the campaign to Save Bennett Island Forever were committed to completing this project, one way or another, and you did it. Now it's time to celebrate! We all deserve it. If you want to help, call or email the office. We raised over $125,000 from over 471 families just like you – people who care deeply about the lake, its wildlife, and its residents. The Town of Strafford’s Conservation Commission, the largest single contributor to the project, provided $50,000. Obviously, the town sees the value of protecting this special place – for wildlife and for Strafford taxpayers, especially seasonal residents, visitors, and recreational lake users. We could not have done this without all of you!